There are three ways to mark images in Lightroom. Each method serves a different purpose and each method should be used in succession. Star Ratings is the second method of three highly selective systems available in Lightroom to mark pictures for later selection. We will refer to Star Ratings simply as Ratings going forward. 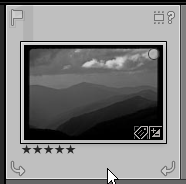 Ratings in Lightroom range from zero stars through five stars and assigning a rating to an image is incredibly easy. The picture to the left shows zero stars. The dots indicate additional spaces available for assigning a higher rating. Before we discuss how to assign the rating in Lightroom, we will discuss how to determine what rating to use. Think of your entire library of images as a giant pile of lottery tickets. Only one ticket is the ultimate winner and only a handful of tickets have smaller prizes. Most of the tickets win nothing. Most of our images in the library should be good, but probably not great. Only a very few images are so outstanding that they deserve a five-star rating. Many images, therefore, should be rated zero stars to one star. If this is the result of our ratings, then finding great to superb images in our library is easy – filtering for four and five stars should not yield too many images to review. 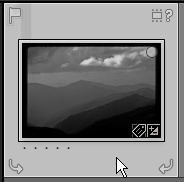 That being said, how do we assign image ratings in lightroom. Two methods exist for assigning an image rating. First, the mouse can be used. Click on the number of stars below the image to assign that rating. Using the dots displayed for a selected image, the first dot to the left is a one-star rating. Clicking there assigns that rating and a star appears under the image. The second dot from the left is a two-star rating. Clicking there will adjust an image either up or down to that rating. As soon as the mouse clicks on the star place, the rating is changed. Saving the image is not necessary. Note that there is no way to assign a zero star rating to an image using the mouse. The keyboard is also an easy way to assign images. Pressing the numbers zero through five on the keyboard will assign that number of stars to the image rating. Try selecting an image and pressing the four key on the keyboard. A brief notice appears and then fades indicating the rating is changed to four stars. Pressing the zero key will revert the image back to a zero star rating. Note also that these commands apply to a group of selected images. All images in the group will be changed to a given rating. This is a good way to assign zero or one-star ratings. All images are imported with a zero star rating. I use a single star rating as a first pass for images that have potential. This can include duplicates. I use a two-star rating to determine those images that I want to consider for further usage. It will probably still include some images that appear to be duplicates, but only if the subject matter is good and the technical aspects are good. From there on out, only great images get higher ratings. I use a three star rating for images that have both excellent aesthetic qualities and technical qualities. These are later candidates for four and five star ratings. Four star ratings include only those images that have perfect aesthetics, but maybe not perfect technical properties. This doesn’t mean out of focus, this might mean that tones or lighting isn’t exactly what I would have liked. Five star ratings are incredibly difficult to obtain. I use a five star rating for the best I have ever taken. These images must be perfect aesthetically and technically. From a portfolio perspective, certainly four and five-star images can be used. Using a three-star image is a matter of personal preference. We will have a later discussion on portfolio selection. We are often our own worst enemy when it comes to selecting four and five star images. We love our own photography and have a hard time assigning a lesser rating to images. My only advice comes in two principals. First, do not use any rating above a two-star rating without time passing from adding the image to your library. Print the image out and view it awhile first. Then determine if it has a three-star rating. Do not jump from two stars to four or five. Second, let others help you select four and five star ratings. Move ratings up from three stars only if other people like the image. You can review the technical portion and some images use the rule of thirds well, but you can only really rely on the general public. Your family can help, but they too tend to be partial to your work. Using a harsh criteria for rating images will ensure that when you need a truly great image, you will select one. At the bottom of the library screen is a section labeled filters. Clicking on the number of stars will filter all images with that rating and above. Thus, in the image above, all images fitting the keyword or folder selections on screen will be filtered to three star ratings and above. Ratings of images are important. However, just like praise, do not hand out high ratings too often or the ability of finding the best images will not exist. Be consistent, but be selective as well.